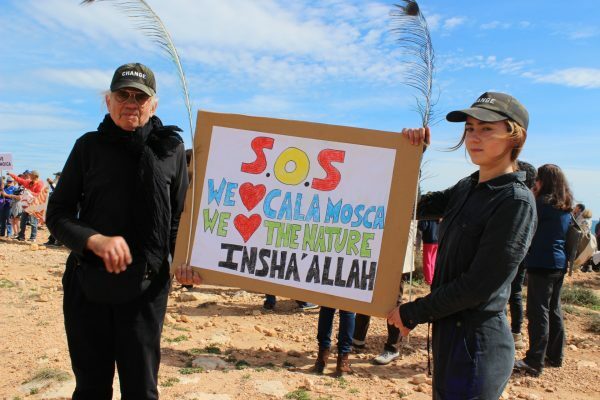 Over 500 people turned up at Playa Flamenca on Sunday morning to show their solidarity with the campaign to defend Cala Mosca, the last unspoiled stretch of the Orihuela Costa coastline. 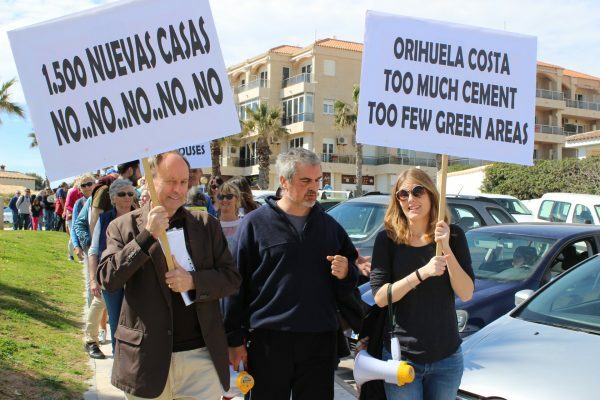 Residents and holidaymakers joined with Associations, Political Parties and organised groups to demonstrate their opposition to the Orihuela Government plan for the construction of over 1500 new properties on the site. They included la plataforma Pro-Orihuela Costa; la FAOC (Federación de Asociaciones de Orihuela Costa) and the Neighbourhood Associations Orihuela Costa Golf, Villamartin, Las Filipinas, Playa Glea, Calas de Campoamor, Altos del Pinar, Cabo Roig Clean Up Committee, C.L.A.R.O, Podemos Orihuela Costa, Movimiento Ciudadano de la Zenia, A.M.P.A Playas de Orihuela, Cambiemos Orihuela, Somos Orihuela Costa and el A.M.P.A Los Dolses. The demonstration was held less than a week after the EU Petitions Committee reopened its dossier on the project, announcing that it will oversee the environmental impact report provided by the constructor, ensuring that it fully complies with all environmental regulations. At the decisive moment when the Developer seemed likely to get the final green light to build, the European Parliament Petitions Committee intervened once again to safeguard the interests of environment protection. The Euro-Chamber has also said that it will write to the Consell, the governmental body that will make the final decision on the project, demanding that it pays special attention to the scheme, and ensures that all of the environmental guarantees provided by law are fulfilled. This was confirmed by the Cambiemos Councillor Marta Guillén following her appearance in the Parliament, alongside former President of CLARO, Bob Houliston who was the first to denounce the project back in 2012. The Committee President added that she would request the European Commission, responsible for the application of environmental law, to carry out its own investigation of the Environment Impact Study. “We are very happy with the response of the EU, and the fact that the matter has been brought to their attention once again. They have committed to overseeing the environmental impact statement and they will now urge the Conselleria to focus on Cala Mosca, “added the councillor. 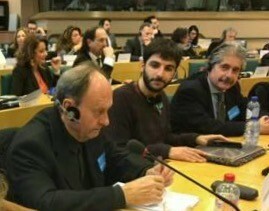 The decisions of the European Parliament Petitions Committee are very important. They ensure that no quick approval will be given to the building project which, before the meeting in Brussels, seemed imminent. The decisions ensure that the regional government of Valencia is aware of the political importance of the future of Cala Mosca and that the European Union will be watching over their shoulders to ensure that a rigorous examination of the building proposal be carried out before any decision is made. Implicitly, the decisions imply that before any final decision, the Petitions Committee should consider the issue again at a further meeting. Cala Mosca enjoys the last kilometer of unspoiled coastline in the municipality of Orihuela, and has been under threat since the 90s, when the development was first muted. The constant demands of residents, environmental associations, and political parties, together with the intervention of the European Parliament, thanks to the request of CLARO, led to the temporary halting of the project in 2011. However, despite the intense political and social struggle, the project has been reactivated, but according to many, without adequate protection measures being applied to safeguard this invaluable landscape. The Euro-Chamber has also said that it will write to the Consell, the governmental body that will make the final decision on the project, demanding that it pays special attention to the scheme, and ensures that all of the environmental guarantees provided by law are fulfilled. This was confirmed by the Cambiemos Councillor Marta Guillén following her appearance in the Parliament, alongside former President of CLARO, Bob Houliston who was the first to denounce the project back in 2012. The current President of CLARO, Karl Falloni, said that it is absolutely ridiculous that the environmental impact report has been written by the builder himself so it is absolutely imperative that the EU take especial notice. Cala Mosca enjoys the last kilometre of unspoiled coastline in the municipality of Orihuela, and has been under threat since the 90s, when the development was first muted. The constant demands of residents, environmental associations, and political parties, together with the intervention of the European Parliament, thanks to the request of CLARO, led to the temporary halting of the project in 2011. However, despite the intense political and social struggle, the project has been reactivated, but according to many, without adequate protection measures being applied to safeguard this invaluable landscape. 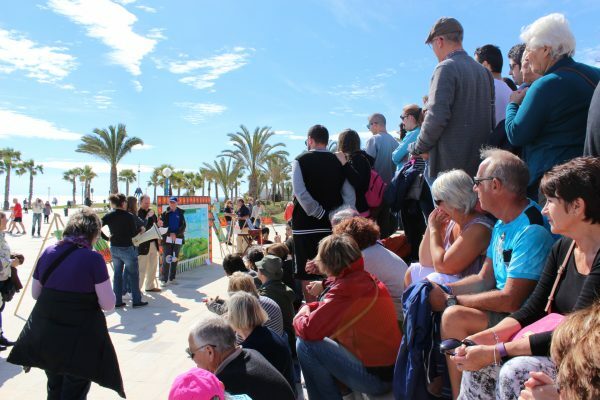 Organisers said thay were delighted by the turnout in Playa Flamenca on Sunday morning and disappointed, but not at all surprised, that there was absolutely no representation from the current Orihuela Governemnt.